Well known companies such as Amazon, Dolce & Gabbana and Facebook have used our services. We have never been late in dispatching a job so place your trust in our hands and we will not let you down. You will be given a unique quote reference number after submitting the form. If you don't get this unique reference number then the form hasn't been submitted successfully. If you have more than 4 files or the size of the files is more than 10Mb, please email or use a file transfer facility (such as wetransfer.com) to send over your files. If you don't have files to send us, just send us an email with your requirements. If you need to get in touch outside of these hours (including weekends and public holidays), try calling us (as we sometimes finish work after 6pm). If we don't pick up, then send us an email as there is usually somebody monitoring the email outside of our normal office hours. If we can produce the flyers (or other prints) to your timescales, then we will try. Same day express print prices follow. These prices are for printing on luxurious 300gsm Silk. Luxury Material: For an extra charge, we can also print on 350gsm Silk, 350gsm Matt, 400gsm Matt or 400gsm Silk. Your postcards can also be Matt or Gloss Laminated. Multiset Discount: Order 3 or more sets and get at least 10% off your order. If you don't have a design OR it is not good quality, then DON'T WORRY. We can create your design (artwork), FOR NO EXTRA CHARGE. OR we can improve the quality of your design (artwork), again FOR NO EXTRA CHARGE. We do lots of FREE work for you that NO other printer will do to make sure your designs (artwork) print well. For complete peace of mind all designs (artwork) sent will go through our Check & Fix Service. It is not easy to create the correct artwork that will print well. Most people don't have the technical print design knowledge to do this. If your design (artwork) is not correct, the end printed result can be poor. 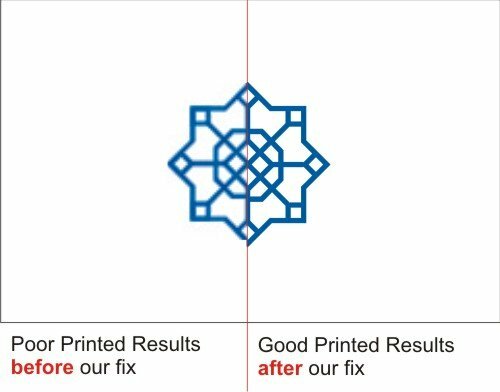 An example is shown below (where we show poor printed results, before we fixed the design (artwork) and good printed results after we fixed the design (artwork). You don't have to worry about providing us with a perfect design (artwork) that will print well. As part of our service for no extra charge, we do lots of additional work for you (which you may not realise)	Remember, no other UK printer will do this extra work for the price we charge you. Inspecting your submitted designs (artwork) to ensure they are suitable for print and informing you if we have any concerns. Redrawing your logos if necessary. Taking a proof from a previous printer/design, a photograph of your postcard or a postcard you like the style of, a scan or even a sketch. The minimum we require is the details you want to place on your postcards. Helping you to create a simple design (artwork) if you don't have your own including creating a simple design (artwork) from fresh. Making any changes to your design (artwork), for example name changes, phone number changes etc. Emailing you proofs of the final version of the design(artwork) that will be used for printing. You can ask us to make changes to the proofs we send you and we will resend more proofs. This backwards and forwards of proof emails continue until you are happy. NOTE: You can cancel at any point until you say you are happy with the proof. We only go to print once you say you are happy with the proof, after which you cannot cancel. You can ask us to make ANY changes required. You can ask us to make any changes (at no extra cost). If you don't have a design (artwork) or an incomplete design (artwork) then send us whatever you have got. This can be a proof from a previous printer/design, a photograph of your postcard or a postcard you like the style of, a scan or even a sketch. We will email you payment details (depending on your needs) and deadlines for payment. We are the cheapest Same Day Postcard printers in London. Our prices are the lowest in London - guaranteed (based on material and like for like service). Same Day Postcards: 50 start at £20, 100 start at £24, higher quantities not much more. Your postcards could potentially be produced in as little as 20mins to taking a few hours to produce. The more time you give us, the cheaper it gets. We also offer next day printing services. We have many delivery options. To save time or in cases of urgency you can collect from our office based in Farringdon (Central London). Our office is also very close to Angel, Barbican, Russell Square, Kings Cross, Islington (including the Business Design Centre). You will also save money if you collect since you will not be charged for delivery. We will email you proofs of your designs, for you to check along with deadlines for responding back. We may call you after emailing the proofs to make sure you have received them. Note: You can cancel your order for a full refund (No Quibbles!) until this point. You approve the proofs. We print. Once the proofs are approved, we will print and dispatch your order or have your order ready for collection, whichever you prefer. If we do not dispatch your order as per what we guarantee, resulting in you receiving your order late then we will give you the printing for free (although we have not been late with any order for over a year). After submitting your order, we will inspect your designs to ensure they are suitable for print and we will get in touch if we have any concerns. To help you achieve the best printed designs, we can make multiple changes and fix problems with your design for FREE. We will email you a proof for all submitted designs and will only print once you are happy. This gives you peace of mind ensuring that what we are printing is correct. "Quality of the business cards are good. Customer Service : beyond my imagination, wish every company is this good. Offered advice over the phone. Understand what the customer wants. Co-operate with me for design, colour and font. Job completed within my deadline. Professional, friendly customer service and high quality printing. Not expensive at all. "Just wanted to say a huge thank you for the work you did on printing my invitations so quickly � they look amazing!